A brackish water, soak the chickpeas overnight. The next day, strain the water, plenty of water and boil until soft. Peel and puree chill through the robot. In a separate bowl, sesame oil, lemon juice, cumin, red pepper, olive oil and salt, mix well. Mixture, chickpeas, add butter, mix well. At this stage, according to your own taste, add salt. 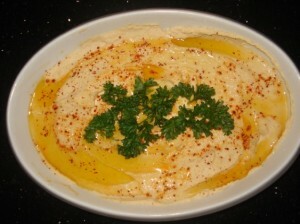 Chickpeas are soaked overnight before adding it to the humus recipe.